旅馆处在半山腰，生态环境很好，能看到很多热带野生鸟类和动物。早餐位于最高的阁楼，能享受到郁郁葱葱的椰子树与湛蓝大海相融的壮观海景，老板亲自做早饭，现榨香蕉汁和木瓜汁特别棒。坐突突车去加勒十五分钟，500卢比，还是比较方便。 The rooms are located on the hill that is enviromently friendly, where you could enjoy close observation of tropical wild animals like falcon,woodpeckers,green parrots and etc. Guests will be invited to have breakfirst at the top flooor where you could enjoy an amazing panoramic view of the bay , they provide fantastic banana juice and papaya juice. Only 15 mins ride to Galle by tuktuk. Although you most likely need to take a tuktuk up to the place (200-300 rupees), the view and the privacy you have is very much worth it. Make sure to book the top apartment so that you can have the best view to the ocean. there is also your own kitchen where you can prepare your own breakfast which is provided by Lara (simple things like toast, eggs, jam, coffee, amazing fruits). Highly recommended if you want to get away from all the tourists and have the perfect view of the ocean. Lara is a wonderful host and will make sure that you have a comfortable stay. The view from Laras Place was magnificent, after a morning of walking and site seeing it was great to just relax on the large balcony and enjoy the view. Despite being up a quite steep hill, I found the walk down to the beach very enjoyable, and where it joins the main road is a bus top which takes you into Galle for 20 LKR or down to Matara for 60 LKR. The food at Laras Place was quite exceptional. The breakfast every morning was huge with beautiful fruits, eggs cooked to order and toast and coffee etc... I ordered dinner at Laras one night and tried the Sri Lankan vegetarian curry. Well it was magnificent, lovingly made and a quantity for several people. I found the staff very friendly, and Lara the owner a delight to talk to. Every day they would fill up the fridge with my favourite beers. I felt like I was a part of the family at Lara's. A delight. super clean rooms with nice furniture! Nice view from top of the hill on the ocean, very good breakfast served in front of the room on the terrace! Nice and kind staff! Despite initial difficulties in finding the place up on the hill (no signs along the road), it was worth The search! 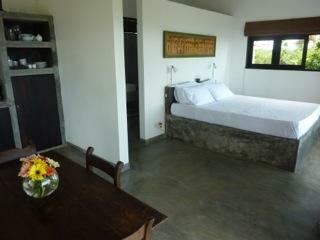 We had a very nice stay and would highly recommended to anyone staying in Unawatuna. 10 min walking downhill to the beach! A friendly welcome in a lovely location with surrounding trees and overlooking the ocean. There is good access by bus and tuk tuk to local places of interest such as the Virgin white tea factory turtle farm and folk museum and the meals were very enjoyable. Definitely recommend for anyone contemplating staying at Unawatuna. THE VIEW!!! Lovely family and perfect breakfast. Perfect start to our holiday - thank you! Big veranda, brand new rooms, really good breakfast!! The rooms are with ocean view up on a small hill. Just a 10 min walk to the beach. Everything seems brand new. Bathroom and Bed really fantastic. Hotel owner very helpful, really great coffee, which is hard to find in Sri Lanka!!! I would recommend a TUK TUK at night, surroundings a bit dark:-))) I would recommend to a friend!!!! !